The task of writing about Commencment and the events surrounding it has always been a bonus of my job—a chance to honor and applaud the students who have taken on the rigors of a Swarthmore education; to cheer for the faculty members who have supported them; and to acknowledge former students who return as models to speak to the outgoing class and receive honorary degrees. And it never fails to move. This year was a little different for me, though. This time, I was suddenly more conscious of the majesty of the tulip poplars; of the graceful sweep of the amphitheater’s granite curves; and of the stage’s wooded backdrop, this day somehow greener. And this year, after all the speeches were over and the honorary degrees conferred, as the graduates filed onto the stage to receive their diplomas from President Rebecca Chopp, I listened, as usual scanning down the names in the program for those I knew, but this time more raptly and with pounding heart. After what seemed like an eternity, even though he’d only reached the bottom of the first column of names, Provost of the College Tom Stephenson, enunciating each name with practiced perfection, finally called out, loud and clear, “Timothy Benjamin Brévart.” Having traversed four never easy yet supremely rewarding years, my younger son had become a Swarthmore graduate. 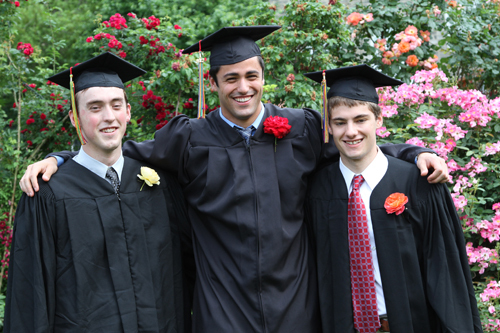 Swarthmore isn’t easy, even for those who sail through high school. Tim knew this, but, still, it was the college he had yearned to attend since he was quite little, when the campus was his playground and he occasionally scored a doughnut from members of the Kohlberg Coffee Bar staff. 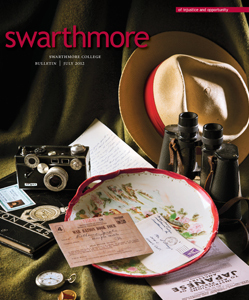 He was overjoyed when his high school guidance counselor suggested that Swarthmore would be “a perfect fit” for him. He applied early decision and was admitted. Tim found the going tough—alongside brilliant peers—juggling academics with daily swim practices and social life at a school with a national ranking of number one for academic rigor. Never, though, did he doubt that he was in the right place. At every turn, he found himself surrounded by teachers, advisers, and student mentors who reached out to offer support and friendship. At Swarthmore, no student “falls through the cracks.” Alongside his demanding psychology courses, Tim was encouraged to enroll in art and music classes he’d never have imagined himself taking and rediscovered a talent for sculpture first manifested in early childhood play-dough sessions. Thanks to his underclass adviser Professor of Educational Studies Lisa Smulyan, who suggested he try Introduction to Education, he declared a special major in psychology and education and found his passion—to teach and help children with special needs. And thanks to his upper-class advisers Professors of Educational Studies Anne Renninger and Diane Anderson, who helped him navigate the education curriculum; and courses with Assistant Professor of Educational Studies Frank Grossman—“a really fantastic teacher”—he’s on his way to pursuing a teaching career.